At CopyFaxes we aim to give you the best experience with top notch service. We know how difficult it is to decide which copier will be most suited for you so we have taken 2 of our popular Canon copiers and compared them. Take a look at this table and see which one will be best for you. 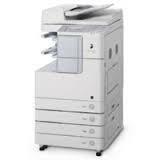 Visit CopyFaxes to order the Canon ImageClass D1350 MultiFunction Copier or Canon ImageClass MF4880DW MultiFunction Copier. Still unsure which one is the best for you? Give us a call on 1-888-298-3095 and we will help you out. Bet you never thought twice about the many documents that you are sending to your office machine every day. Well, in a recent blog post, we alerted our readers to the fact that your copier is actually storing every document that it processes on a hard drive. This obviously poses a great security risk to your business, as all your confidential information can be accessed by malicious parties. Default Passwords: A default password for all administrative accounts means that everyone has access to everything. Using the same standard password on your copier means that all stored data is available to view and configure, both locally and remotely. Unencrypted Data: Every document that is scanned, copied, printed or faxed is stored on the hard drive of your machine and is therefore vulnerable to be captured. All sensitive paperwork that is not encrypted can be accessed and exploited. Outdated Operating Systems: As with any computing device, if the software is not updated regularly, it is possible for others to take control of the device remotely and access the stored data on your machine. Maintenance Personnel: Be aware that every time your machine is serviced, you are giving access to those working on your machine. Disposing Of Your Machine: Whether you sell on your device, or you send it for refurbishing or warehousing, all the data stored on the hard drive of your copier remains accessible for use and exploitation. Unauthorized Use: If not configured properly, your office machine will process any job that is submitted to it, regardless of the origin or lack of authorization. This can result in a waste of paper, toner and ink. Denial Of Service (DoS): Without proper protection, your office machine is vulnerable to a DoS attack – a malicious attempt to make your device unavailable to you. Alteration Of Passwords Or Settings: If an unauthorized user accesses your machine and alters the passwords, you will be blocked from using your own device. Security breaches are expensive in regard to both business finances and reputation. It is your responsibility to ensure that your machine is not compromised in any way. Want to learn how? 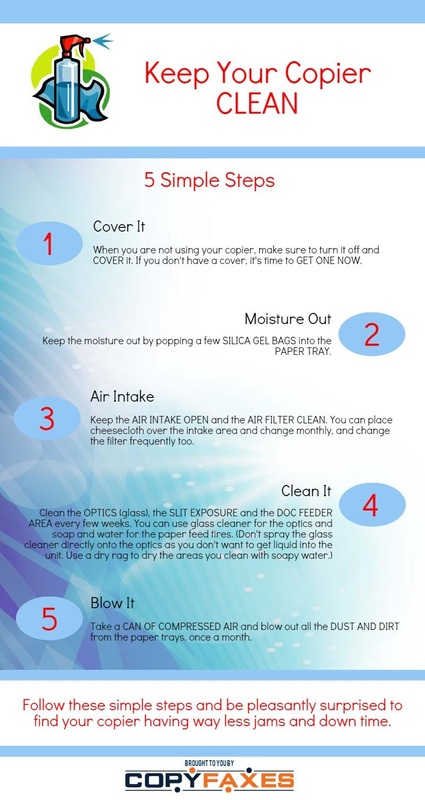 Stay tuned for our blog post on how to protect your copier. After investing in a new, expensive copier, you may think you don’t need to think about it for a few years at least. But if you want to keep your copier up and running with as few jams as possible, you’ll want to invest a bit of time every so often in keeping your copier clean. Follow these simple steps that will take little time and make a big difference. Not only will you benefit from a copier that’s running smoothly to keep up with your workflow, you’ll also be saving big bucks on maintenance costs. It’s worth it. You’ve invested in a new copier and you don’t want to have to replace it as quickly as you had to last time! But it’s out of your control! 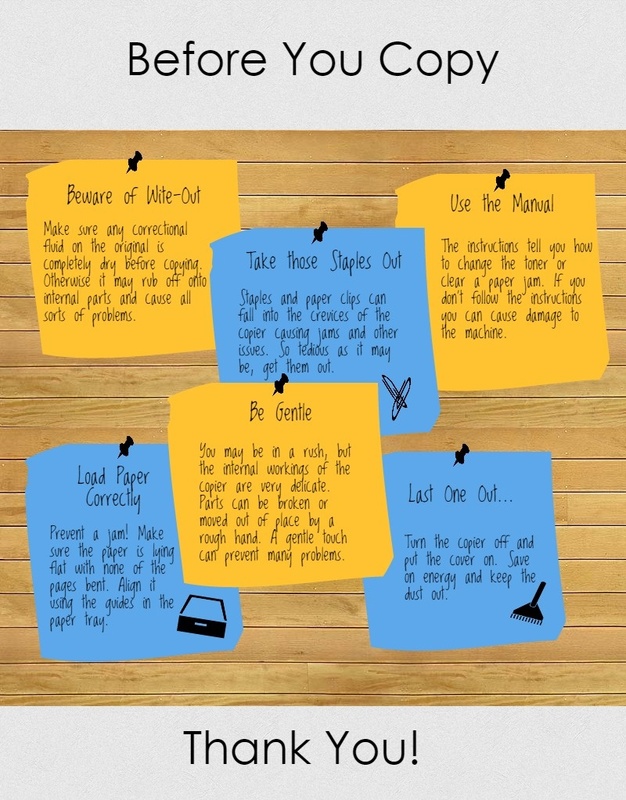 So many other people use the copier, how can you make sure they look after it the way they should? See if this works! Print out the infograph below and hang it near the copier where it won’t be missed by anyone who uses the copier. There’s nothing too complicated or timely on it, but small things that will make all the difference. And, hey, maybe there’s something even you never knew was detrimental to the life of your copier. Keep us posted if your copier is being better looked after than before! … a second time because your first will no doubt last a lifetime!! Deciding on a Canon Image Runner is always a good choice. They are famous for their extraordinary standards of quality, security, and performance. With a Canon Image Runner around, your organization will be raised to a completely new level. The Canon 2525 copies and prints in black-and-white at fast speeds of 25 ppm. It scans in color at up to 25 images per minute with a scanning resolution of 600×600 dpi. It also has a fax option if you need it. You can choose from the large choice of finishing and sending options, to add just the ones you require. With its standard duplexing, you can print either single or double-sided. A large maximum paper capacity of up to 2300 sheets allows for plenty time before paper needs to be refilled. This powerful, monochrome multifunction device will not let you down. Packed with its many wonderful features, the Canon IR 2525 will add that finishing touch your office is waiting for. It will become such a vital part of your workplace that you’ll wonder how you ever managed without it. You can configure this Image Runner to suit your exact needs. You’ll immediately be attracted by its compact, sleek design. Its performance will save you time and money. With this reliable machine, you can rest assured that all your tasks will be taken care of. 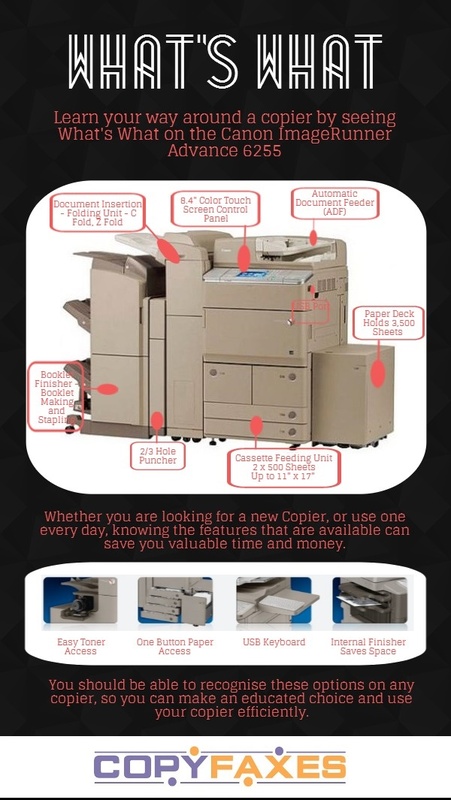 Are you in need of a copier, but you’ve never used one before? Or do you avoid using the copier at your workplace, because you don’t know your way around it? 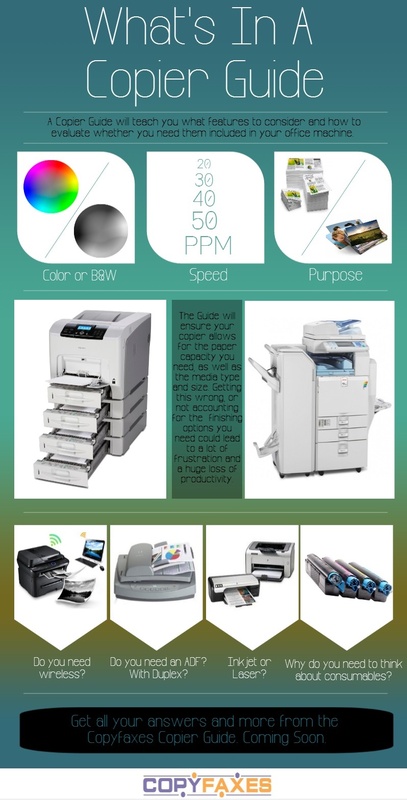 Learn the different options and features of copiers on the infograph below.